Meet 12:30 at the electric charging points, he says. I'm over there for 12:35 and it's blinkin' parky. Eventually I call him at 12:40. Leaving now, he lies. There's more to life than time, you know, but not much more. It's agreed that we should point the motor due east towards that there Ipswich. Now 1pm and the joint, it jumps: mostly student age (UCS is over the road) but not all. Pizza boxes -- ooh, lots of Scrabble points -- clamber to the ceiling. Large overhead menu also lists risotto and jackets. A moment or two of decision paralysis, then we're done and sat by the window sipping refrigerated beverages. Feels like the best part of 10 minutes before our orders emerge. Yum, big steaming bowl of penne with spicy sausage for me, while Andy's panini is "the best I've had". High praise: top bread, he says. Hadn't anticipated this level of freshness and fulness. Boyton Boy has room for pudd and goes for the tiramisu, which is delivered with a swish and poshly presented on a plate. I'll settle for a latte and that's good, too. 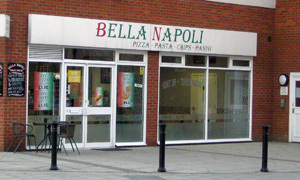 Until there's a Cafe Bencotto in Ipswich, Bella Napoli will suffice. If it was a car -- Alfasud. If they were passing by -- Simon Calder.